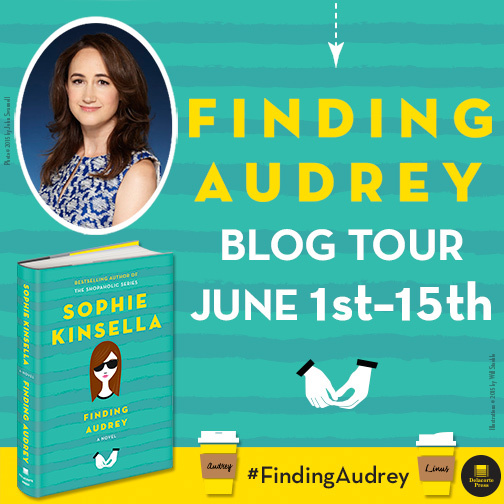 Today we are thrilled to be a stop on the blog tour for Finding Audrey, the first YA novel by best-selling author Sophie Kinsella. Check out our review and look for the giveaway at the end of the post! I want to start off by saying that I had high hopes going into this book because I love Sophie Kinsella’s Shopaholic books, and Finding Audrey lived up to all of my expectations. Audrey is a fourteen-year-old girl who was the victim of a bullying incident at school. As a result, she has developed social anxiety disorder. Audrey is extremely uncomfortable around anyone outside of her family, so much so that she wears sunglasses at all times just to avoid eye contact. Some days Audrey can barely leave her bed or her house. Comic relief comes in the form of Audrey’s family members. Finding Audrey opens with the line: “OMG, Mum’s gone insane,” with Audrey’s mother throwing her son’s computer from a window because she is unhappy with his “addiction” to video games. Audrey’s mother easily falls prey to suggestions from a tabloid-like magazine and often takes her responses to an extreme, but at the end of the day, she does everything because she wants the best for her children. Her extreme responses, however, provide comedy for the reader, even if they’re not necessarily the most realistic. Audrey’s older brother Frank is a big video gamer. He has the right balance of snark and awkwardness for a teenage boy dealing with an overbearing mother and feeling uncomfortable and unsure about how to treat his sister. Scenes with little brother Felix and Audrey’s dad also made me laugh out loud. Anxiety and mental illness are topics that can be difficult to write about, but Kinsella did a very good job. We go on the journey of recovery with Audrey and we see her improvements (shoe contact! thumb contact!) and her struggles (panic attacks at Starbucks). What stood out most to me about this was the honesty surrounding recovery from such a severe case of anxiety: we see the ups and the downs, the jagged graph that Audrey so desperately wants to avoid. If she was on a straight line to recovery, it wouldn’t be realistic. I really liked Linus as Audrey’s friend and romantic interest. I loved that he wants to talk to her and get to know her, but he also keeps his distance when she needs it. And who doesn’t love a guy who is willing to stand on the other side of a door and pass notes through the mail slot? Yes, maybe it’s not 100% realistic for a teenage guy to act like that, but it’s also a nice reminder that you can be loved even with a chronic/mental illness. 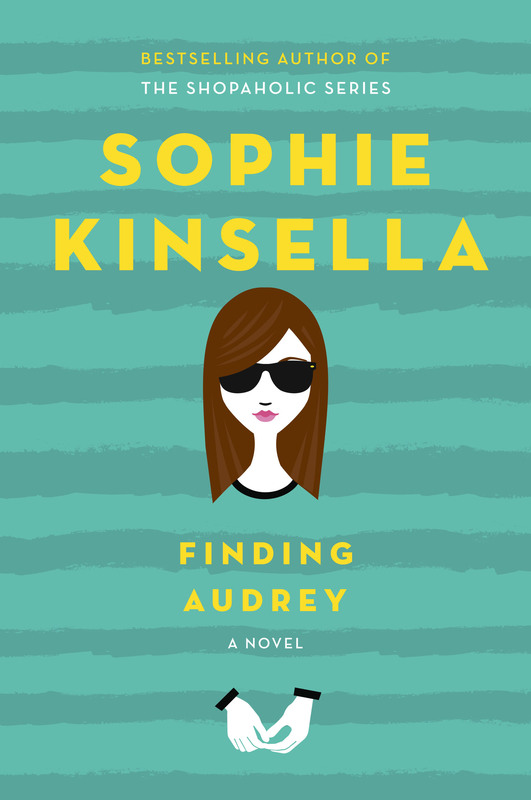 Kinsella has a knack for tackling tough topics with humor and quirky characters, and that stays true in Finding Audrey. I recommend it as a fun summer read. Audrey is a relatable character with a story that keeps the reader intrigued and entertained. While Finding Audrey is technically a young adult book, this is a story that people of all ages can relate to. Finding Audrey will make you smile, laugh, “Awww,” and root for the characters. 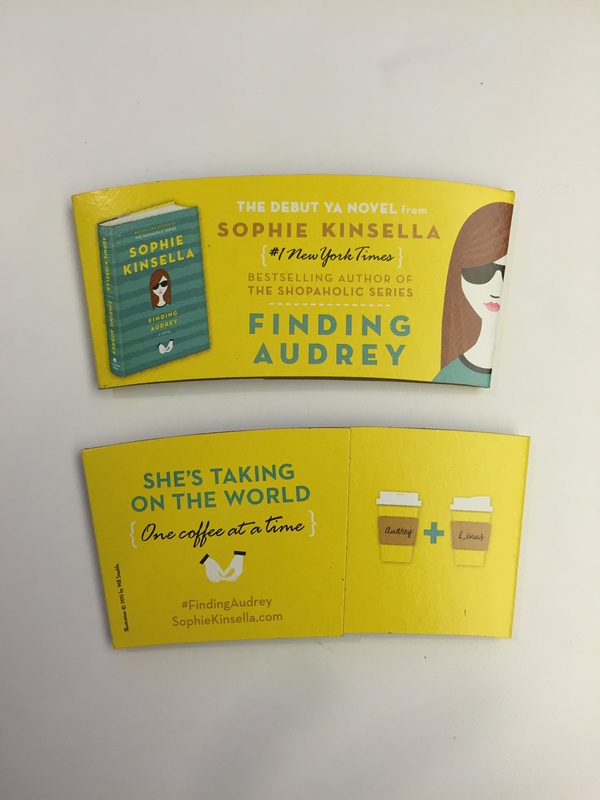 And to celebrate the release of this heart-warming book, we get to give away a hardcover copy of Finding Audrey and a Finding Audrey coffee sleeve!